A citizen of the Carbo-Nation suggested a while back that we search out and try some Saranac Root Beer. Well guess what, “Person reading the Saranac – Root Beer Review”, we got some! The Saranac brewery (est. in 1888) is located in New York and, much like other beer breweries, they have a root beer for us non-alcohol drinkers. This root beer sits in an unassuming bottle with a classy looking maroon and gold label. Oddly enough it reminds me of the Cheers logo. Sadly, after looking at the ingredients I see that this is both sweetened with high fructose corn syrup and includes sodium benzoate. These are two chemicals no Soda Jerk wants to see; regardless, let’s open her up! It has a very nice root beery smell… to put a description on it I’d say it smells like a high end A&W root beer. Now that the shortest part of the review is over: On to the consumption! This is a good root beer. The end. Done. No, no, I’m only kidding. There are plenty of words to follow. It has the initial mouth feel of an IBC root beer but oddly enough it’s not quite as heavy. The amount of carbonation attacks your tongue with every swallow in a quick but hard hitting fashion. The finish is so quick that I’m not going to mention it… other than mentioning that I won’t mention it, that is. This has more bite than any root beer I’ve had to date; it’s not smooth at all. When I first saw this bottle I thought I’d be drinking a generic root beer that didn’t set itself apart from any other root beer in a brown bottle. I’m happy to say that I was very wrong. If you put this in a root beer line up I’d easily tell it apart from the others. Wow, I can’t get over how harsh (in a good way) this attacks the back of my throat. It’s like you fell asleep with your mouth open and there’s this guy who thinks he’s funny, right? But in reality he’s just a guy you happened to sit next to on the first day of class and unfortunately for you, you accidentally laughed at one of his pointless jokes so now you’re “best buds”. No matter how many times you tell him to buzz off he stays around making the same level of horrible joke... staring at you, waiting for you to laugh like you did the first time. What an idiot…Oh yeah I was talking about something! It’s like he dropped a pinch of pop-rocks onto your tonsils. You’d be surprised at first, but it’d be tasty enough that you’d repeat his stupid prank, placing more pop-rocks onto your tonsils, fueling his fire… making him stronger… never being rid of the constant staring… the staring. 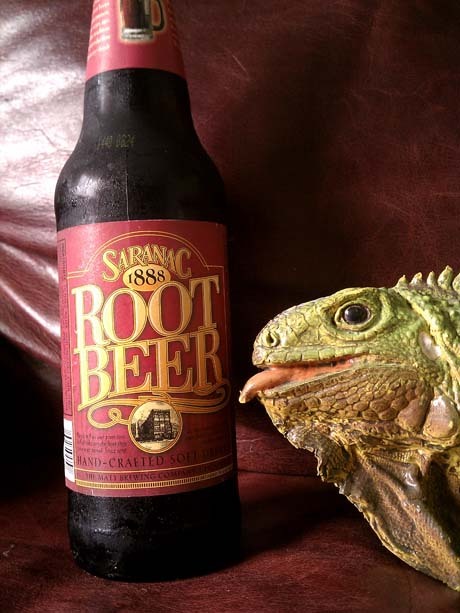 Faux Fact: Iguana's can't feel pain when it's caused by root beer.